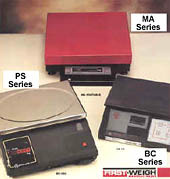 First-Weigh offers a selection of three different bench scales. Just choose the model that fits your need. Complete and ready to use. No assembly required. You can carry it to the work station. It’s made of sturdy, fabricated steel construction. It’s a utility scale for every industry. It’s constructed of A.B.S. Plastic case with a stainless steel platform. This series features a simple operation with multi-function push button tare key. Capacities 15 lb., 30 lb., 60 lb. This model is great for portion control. The counting function is a standard feature. It has a four button multi-function keypad. Capacities 6 lb., 15 lb., 20 lb. 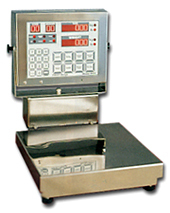 The CD Series is a complete system including base, column and digital indicator. Available in stainless steel wash down construction or painted mild steel for general use. Use for harsh, wet environments. U.S.D.A. Approved. Designed for fish, poultry, meat, chemical and food processing industries. All bases contain a rugged, sealed, NTEP Certified single point load cell. Capacities 10 lb. – 1,000 lb. The SP and SS Series scale platforms are built to a standard of quality far above their price. They are potted and sealed against moisture, built with ultimate accuracy and sensitivity, and trouble-free rugged construction with industry compatible electronics. Adjustable stainless steel feet. Exclusive First-Weigh designed plated tool steel single point LC12 or LC16 load cells. Will withstand 150% of rated scale capacity without load cell damage.